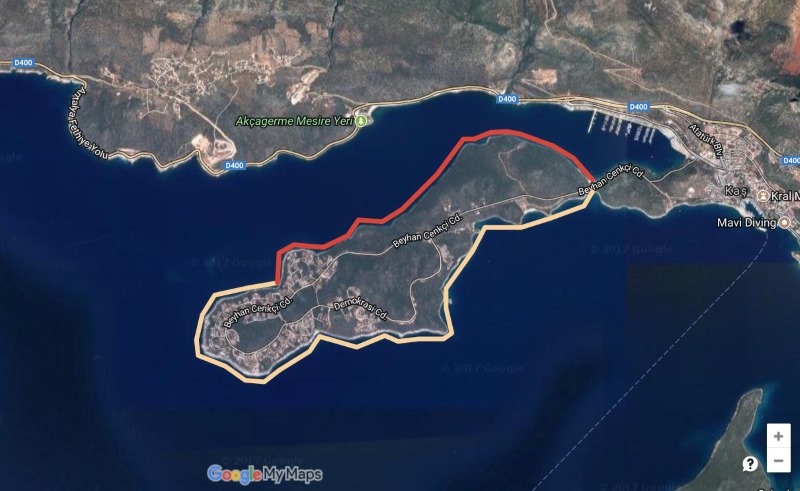 Train To Extend Your Energy | Mediterra - Swim & Run Better Than Ever! If you are aspiring to swim longer distance – whatever is ‘long’ to you – I want to recommend to you a different way to view what you need to focus on in your precious training time. In the first half of practice, when energy is abundant and you feel strong and eager – your main objective is to train your body to extend that sense of abundance, that sense of ease, longer. Do not be careless and wasteful in your movements even though you feel that you can afford to be so. In this situation, a stroke thought that is effective is to swim ‘quietly’ to keep splash, waves, sounds, bubbles and all unnecessary turbulence at a minimum, no matter your effort level. This overarching objective urges the brain to find ways to move forward with the least amount of waste of energy, because all those things you are trying to avoid are the most direct feedback you’ve got regarding wasted energy. 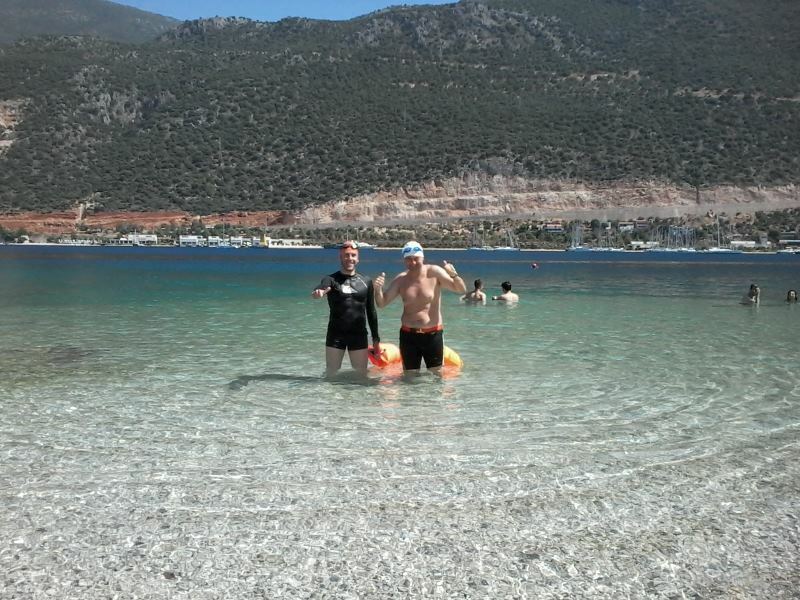 Jamal and Holger finish their first open water 10+ km around the peninsula at our camp in Kaş Turkey. In the second half of practice, when energy is scarce and you feel tired and less certain you can keep up the effort – your main objective is to train your body to preserve what energy you have and make it last longer. Take care to protect the features of your body position and movement patterns that have the greatest impact on protecting your streamline shape. Fatigue will urge your form to collapse. With waning energy, your brain too is being more limited in what it can hold concentration upon. Since you can’t do as much as you could in the Abundant Energy Zone, in the Scarce Energy Zone keep your best attention on those features that count the most to keep drag the lowest and forward movement the easiest. In this situation, one primary stroke thought that I promote and practice is to emphasize my actions which “Send Force Forward” rather than think about pulling back harder on the water or spinning the arms faster. Jamal and Holger had a chance to get out at 6 km (yellow route) but felt so good that they decided to carry on to see how far they could go. A great example of making their energy last longer. In both halves of practice, being conservative with energy, being obsessive about economy is the point. Energy is scarce and it is replenished slowly – too slow for it to catch up after that initial sensation of abundant energy has passed. So, you’ve got to train in such a way to get as much as you can out of that scarce resource and this conservation has to start at the very beginning of practice. By being careful from the beginning, you set the standard and pattern for the rest of your practice, and end up with more to work with toward the end. By being careful in the end, when everything is urging you to be sloppy and give up, you last even longer and stay stronger, stroke longer, and maintain pace better than you would otherwise. You can read more about this concept in Training In The Scarce Energy Zone.